It’s November, time to start thinking about that Christmas mantel! I’ve joined a talented group of awesome decorators to share beautiful ideas to get your wheels turning! So untangle the lights, dig out the tinsel and let’s get started! All the Christmas decor for the mantel was inspired by the banner that I purchased at Target from the $1 section, I wish I could say that it was $1, it was actually $3. One thing lead to another and the plaid theme was born! 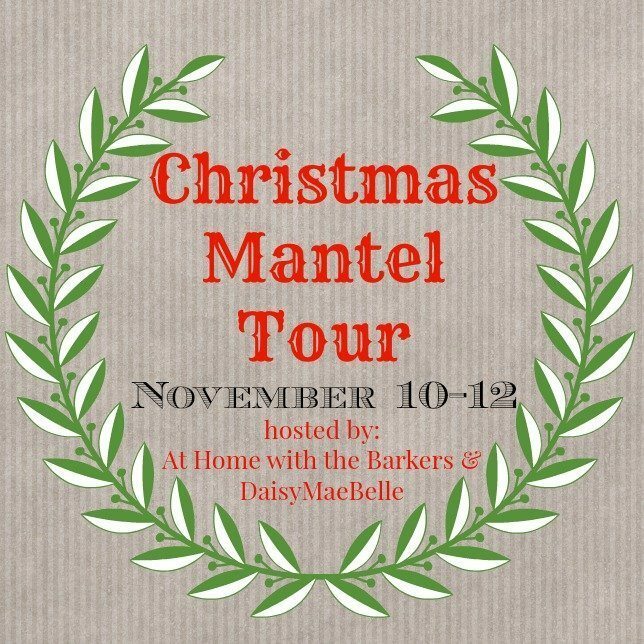 I’m not the only one sharing a mantel idea, thanks to Sonya – At Home With The Barkers and Melissa – Daisy Mae Belle for organizing a talented group of bloggers mantel tour! 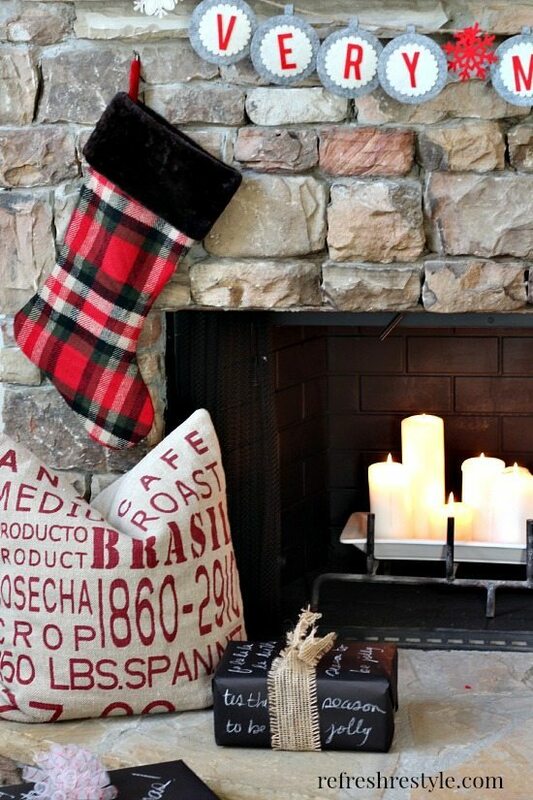 The plaid goes great with the rustic stone fireplace. The stockings are from Hobby Lobby. I’m using my antique wooden sleigh, as soon as I purchase gifts and put up the tree it will be holding presents. Chalkboard this and that ideas are everywhere, so I jumped on the chalkboard wrapping paper train! 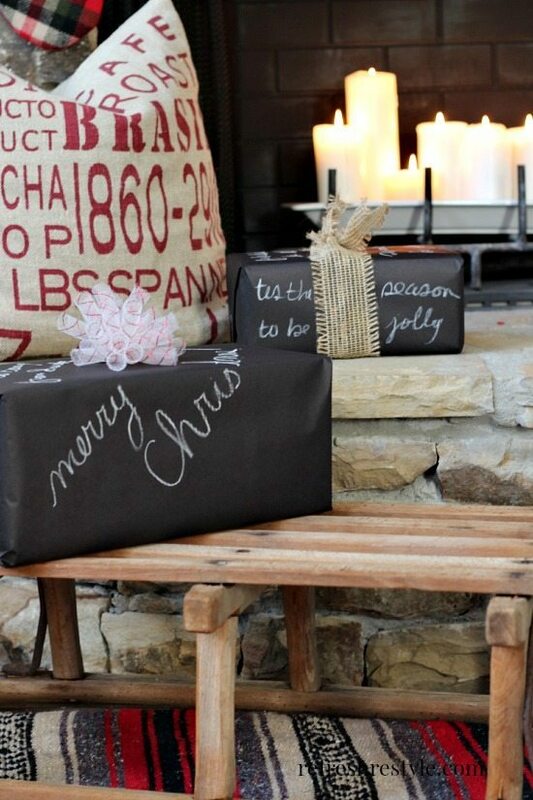 I saw some at Walmart the other day or Black Chalkboard Kraft Gift Wrap Flat Sheet 24″ X 6′ – Holiday Gift Wrapping Paper this is my Amazon affiliate link. I wish I could find some real birch logs, but these candle holders from Hobby Lobby were a great stand in. They look like they’re going to burn the stocking, but they are really in front of it. We’re going to add gas logs soon but for now I placed white candles on a ceramic tray to create a little glow. Love a $3 inspiration! That 3 bucks went a long way. I love the plaid & the cozy feel. Well done Debbie! It’s absolutely stunning, Debbie. I don’t have a mantel but I pretend like my piano is one 🙂 Decorating that space is not my strong suit but I’m learning. Sharing your post today! 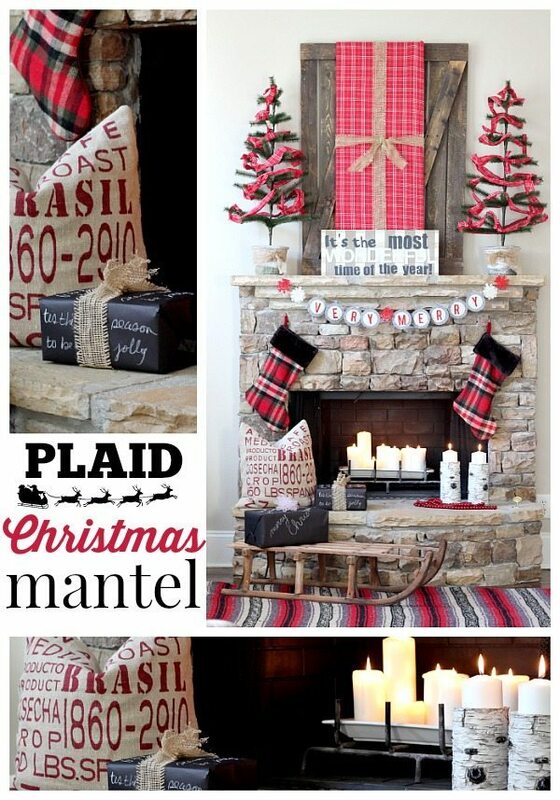 Love a classic plaid and your mantel is rockin’ it! So beautiful… Pinned! So happy to be on tour with you. 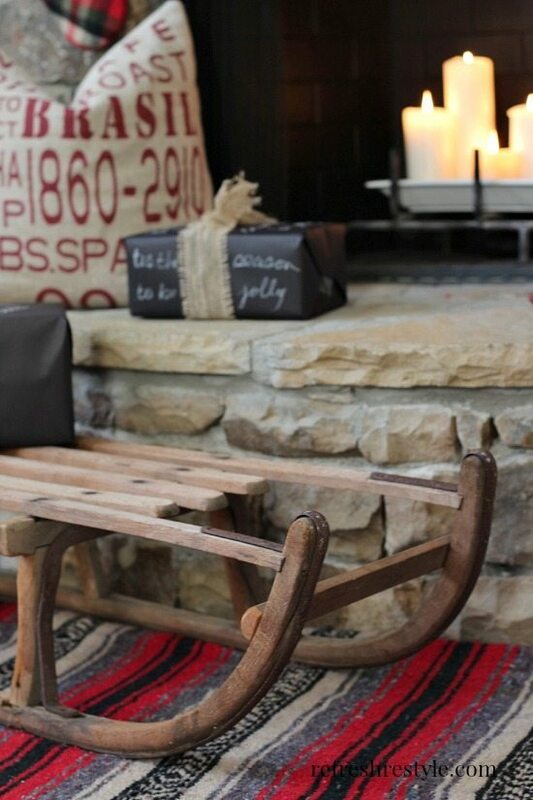 Love the rock that’s used in your fireplace! Your Christmas banner is adorable, along with everything else! Debbie, out of all the mantels, yours is my very favorite!!!! LOVE IT! Beautiful! I love the contrast of the plaid against your stone fireplace. I also like how you are using candles until you get gas logs. They must look so pretty at night! looks awesome! you know i love those mexican blankets, and mix in some plaid- perfection! Debbie this is just so amazing! It feels like it belongs in a mountain chalet and I just want to cozy right up to that gorgeous fireplace. You perfectly captured the warmth of the season! Cannot tell you how much I love this Debbie!!! !….I pinned away! Your mantel is absolutely stunning Debbie! I love the plaid SO much! 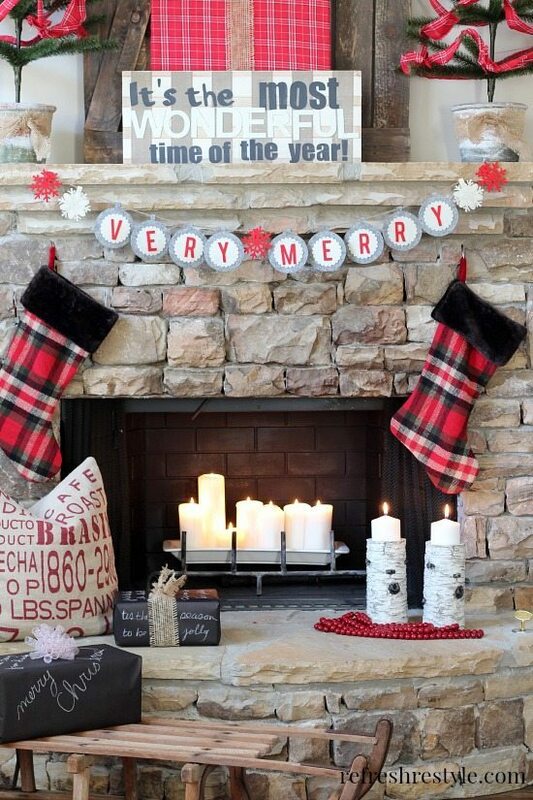 Your mantel and fireplace look amazing! Love that cute $3 banner from Target. Gotta love good ol’ Tar-jay! 🙂 So happy to be touring with you! I love your plaid and your fabulous trees, what a gorgeous vignette. 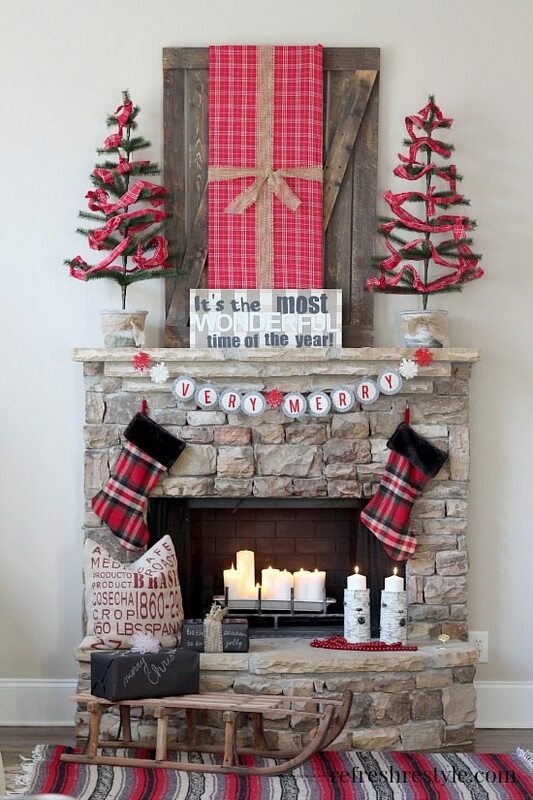 LOVE, LOVE, LOVE this rustic plaid mantel Debbie! It’s SO warm and cozy it just makes me want to curl up with a cup of hot chocolate in front of the fire! 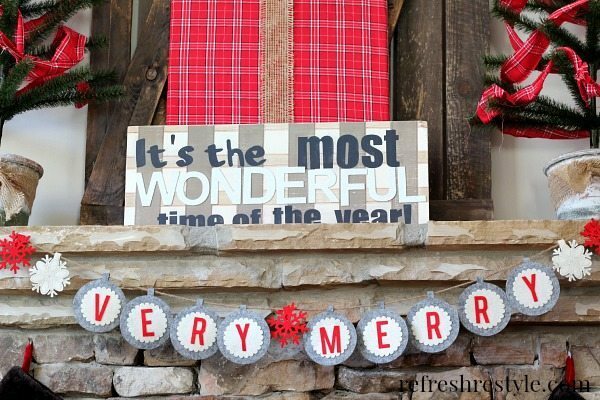 Your Christmas mantel is absolutely gorgeous! I love the plaid…it’s such a great classic! Have a great day. LOVE the plaid Debbie!! So beautiful, cozy and inviting! I have an antique sleigh like that too! Pinning!! how stinkin pretty in plaid is your mantel. love it. i have those same candle holders from HB. hope you are enjoying your new home.